Ugly Friday Night Loss to the Monsters · Let's Go Amerks! What was uglier, the loss or the jerseys? That was a question everyone was asking Friday night after the Monsters showed up in town and handed the Amerks a 5-2 loss on home ice. 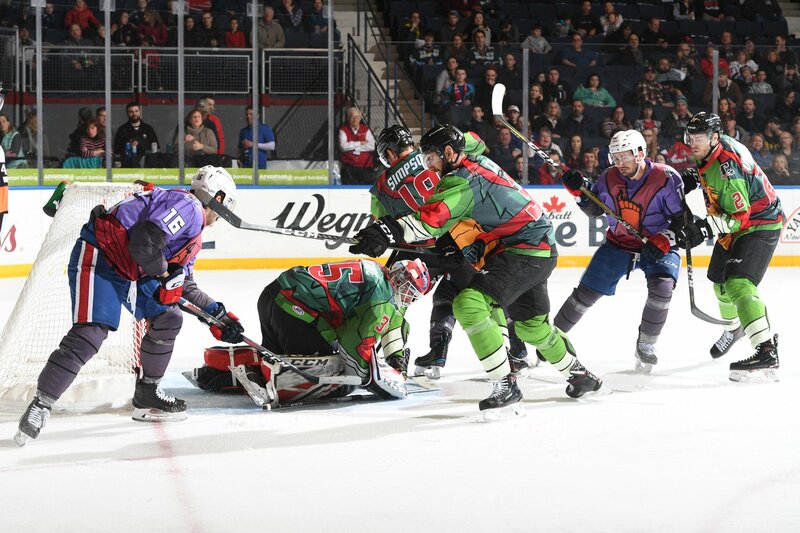 It was a special jersey night sponsored by Nickelodeon that featured the Monsters in Teenage Mutant Ninja Turtle themed jerseys and the Amerks in foot clan jerseys. The teams wore them once in Cleveland as well earlier in the season. Hopefully those jerseys are never seen again and hopefully that’s the last ugly loss of the season or it’s going to come to an end pretty quick. That’s the game right there. Rochester showed up in the third period ready to play but it was 40 minutes too late. Two weeks ago the Amerks were sitting in first place in the North Division. With two more games this weekend versus Toronto there’s a chance they could fall to third place in the division. At a time of year when teams are picking up the pace this team is quickly fading. Trouble is at the door step after the third consecutive loss. It’s also the third three game losing streak of the season. A Victor Olofsson goal at 7:02 of the third period to get the Amerks within a goal did give the team a chance but it was a deceiving chance. Cleveland was playing on their heels and they weren’t able to take advantage of it. Monsters goalie Jean-Francois Berube stopped a shot with 2:38 left in the third period and had to be helped off the ice. He appeared to be favoring his right knee/leg. Brad Thiessen entered the game to finish and with a cold goalie in net it was an opportunity to test him. It didn’t happen. There were shot hesitations and overall he had an easy task finishing the game. An empty net goal by Mark Letestu with 1:54 remaining appeared to seal the win. The Amerks were still trying but it didn’t work. Justin Scott scored another empty net goal with 18 seconds left and the game was over. Going back to the start of the game, Derek Barach scored his first professional goal on the power play with 2:10 left in the period. Andrew Oglevie attempted to clear the puck from behind the red line but it was knocked out of the air. A quick shot, a juicy rebound, and Barach scored the goal. Zac Dalpe scored his 24th goal of the season to give Cleveland a 2-0 lead at 4:27 of the second period. A shot from the point found it’s way through a bunch of bodies and into the net it went. CJ Smith scored a highlight goal on it’s own if the rest of the game didn’t matter. Will Borgen delivered a cross ice blue line to blue line pass to Kevin Porter who sauced it into the middle where Smith was skating in and he flipped it into the net. Alexandre Texier scored his first professional goal as well for the Monsters at 15:13 of the second period. Jack Dougherty attempted a shot block but instead it redirected past Wilcox. Rochester travels to Toronto to play back to back games Saturday and Sunday. They’ll be facing a team that sits only three points back in the standings. Overall the loss wasn’t because of one thing, it was a combination of a lot of things and as Chris Taylor said, an overall bad game. On Monday the story line could be a seven point gap over the third place team or it could be a first place team falling to third place. There’s only 11 games remaining in the regular season and this could be a big turning point.